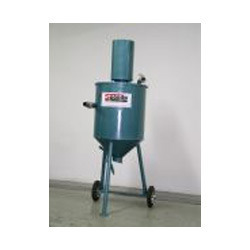 Vacuum Tank has been designed to be an easy tool to use. By understanding the simple set up, you can discover an endless number of applications. When material is to be collected, a vacuum hose is run from the vacuum tank to the material to be picked up. Because a vacuum is pulled in the tank, it is important there will be no air leaks and that a good seal is maintained between the lid and the tank. It should be mentioned that the vacuum tank would not perform satisfactory if the material to be vacuumed will not visually flow. A simple, quick check is to take a handful of the product and compressed it in your grip. When your grip is released and the material does not flow through your fingers, it will not move effectively via vacuum. Compressed Air Inlet: 1 1/4"
Tank Dimension: Dia 23" x Height 24"
Established in the year 1974 at Singapore, we, “Speedo Marine (PTE) Ltd.”, are engaged in manufacturing and supplying an extensive range of Autoblast Machinery, Blast & Vac Equipment, Internal Pipe Blasting, Portable Pressure Blast Machine, Blast Chambers, Abrasives, Dehumidifier, Lift-Up Door, Spray Chamber, Spray & Ink Painting Equipment, Speedo AC, Vacuum Tank, After Cooler Outlet, Blasting Cabinet, etc. These products are manufactured in accordance with the set market norms using supreme quality raw material and the latest technology under the guidance of our skilled professionals. The raw material that is used to manufacture these products is procured from the most reliable and certified vendors of the industry. These products are widely demanded by our clients for their fine finish, high tensile strength, optimum performance and enhanced durability. Our offered products are also tested on various well-defined parameters in order to deliver the perfect range of product at clients’ end. The entire product range is available in various specifications & can also be customized as per the variant needs of our esteemed clients.